The global recreational vehicle market has been strengthening its stance significantly across the worldwide transportation cosmos, having emerged successful in amassing considerable sales since its inception. The primary factor fueling rapid growth of the RV industry is the rising level of average household income – which in turn has facilitated individuals to increase the amount they are spending on tourist and recreational activities. Recreational vehicle market, which was valued at over $36 billion according to a 2017 estimate, is expected to continue to draw in more growth from the tourism sector in the coming years. Recreational vehicle (RVs) are quickly becoming the crucial aspect of a majority of recreational and camping activities for quite a massive percentage of the global populace. Indeed, the popularity of these vehicles, as on today, has reached such a point that they have become synonymous with road trips and camping. According to an early 2018 report by the RV Industry Association (RVIA), 89% of consumers rent-out or purchase RVs for camping purposes. Moreover, as the standard of living rises and government spending on infrastructure continues to improve, more and more recreational facilities such as national and state parks are being developed and promoted as vacation destinations. With such favorable conditions and easy availability of capital, many rental agencies are offering their services to enhance customer convenience through features such as accident insurance, shared payments, low prices and 24-hour roadside assistance, allowing customers to rent out either a motorhome or a caravan. Motorhomes – an RV design where the living quarters are designed around a motorized vehicle – are currently one of the most preferred RVs and contributed over 50% toward recreational vehicle market share in 2017. Such high numbers mostly due to the convenience and luxury they bring to the segment. The motorhome sub-segment is further classified into three different types – the Type A motorhomes, typically the segment’s most premium offering as they are generally more roomier and come equipped with various kinds luxurious amenities, Type B motorhomes, also known as van campers are large family van-like vehicles where the interior is swapped out to make it a RV, and the Type C motorhomes, that offer similar amenities as the Type As but, on a smaller scale. The sector’s luxury quotient has been highly successful in drawing in more well-to-do customers to the point that it has prompted global luxury vehicle manufacturers like Mercedes to enter the segment with a RV model of their own. Mercedes recently announced that the company along with its longtime partner Hymer – a renowned caravan maker – is working on a new range of Type B motorhomes that would be launched in 2019. The move has been touted to be extremely lucrative as Type Bs are expected to witness stronger growth due to their less cumbersome nature and fuel efficiency when compared to the Type As. Towable RVs – designed to be hooked up and towed behind a vehicle – are extremely versatile and come in all sorts of shapes and sizes, offering potential customers more choice in comparison to motorhomes when it comes to their needs. Towable RVs possess this versatility factor because manufacturers do not face the same design constraints that they encounter when making motorhomes. Moreover, the recent advancements in composite materials are further freeing up caravan makers from design limitations by allowing them to construct bigger and more sturdy towable RVs without having to worry about the unit’s weight. One such example of design freedom is the Global Caravan Technologies’ CR-1 Carbon trailer – a towable luxury RV that is made out of carbon-fiber. Aided by the spate of technological advancements, towable RV market is expected to witness an impressive CAGR of 6% over 2018-2024. The towable RV industry would also depict an accelerated growth on the grounds of the fact that towable units require less maintenance and are significantly more economical when compared to their motorized counterparts. 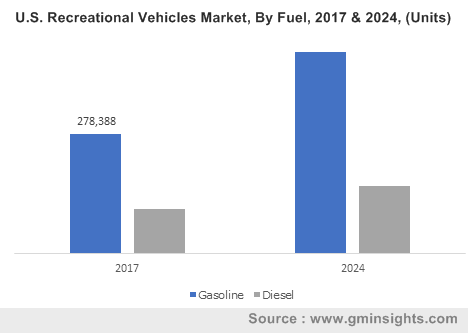 Attributed to the ever-rising demand for luxury vehicles and the expanding tourism industry, recreational vehicle market is projected to continue gathering exponential momentum. According to a report by Global Market Insights, Inc., recreational vehicle market size is expected to be pegged at an appreciable $56.5 billion by 2024.